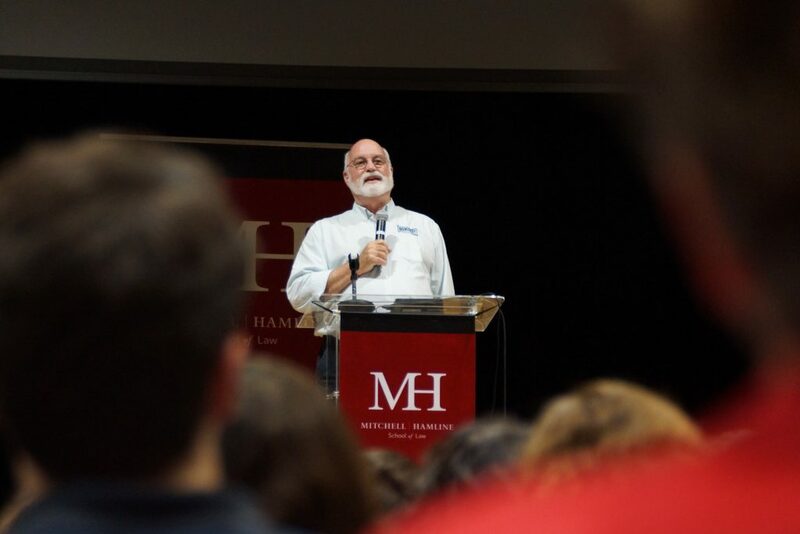 Mitchell Hamline School of Law and the Ramsey County Attorney’s office hosted a conversation with Father Gregory Boyle, founder of the Los Angeles-based organization Homeboy Industries, on Tuesday, Sept. 4. 300 people packed the school’s auditorium to hear the story of how Boyle founded Homeboy Industries after the L.A. riots in 1992. The organization helps former gang members—both men and women—become contributing members of society through job training, counseling, and support. Each year, over 10,000 former gang members from across Los Angeles come through Homeboy Industries’ doors in an effort to make a positive change. Father Boyle is the author of “Tattoos on the Heart: The Power of Boundless Compassion” and “Barking to the Choir: The Power of Radical Kinship.” He is the subject of Academy Award winner Freida Lee Mock’s 2012 documentary, “G-Dog,” has received the California Peace Prize, and was named a Champion of Change by the White House in 2014.